That trench is just blows my mind. I think we might need an official weapons count from mr. Sponge when it’s done, if you don’t mind mr. Sponge. This is coming together!! Love what you do!! Cant weight tell its finished!! Corrections welcome, if you spot anything I’ve missed (see Ryadra777’s thread below for explanation of missing octuple barbettes). Edit: Nevermind, now see that they’re re-oriënted neutrino radiators. 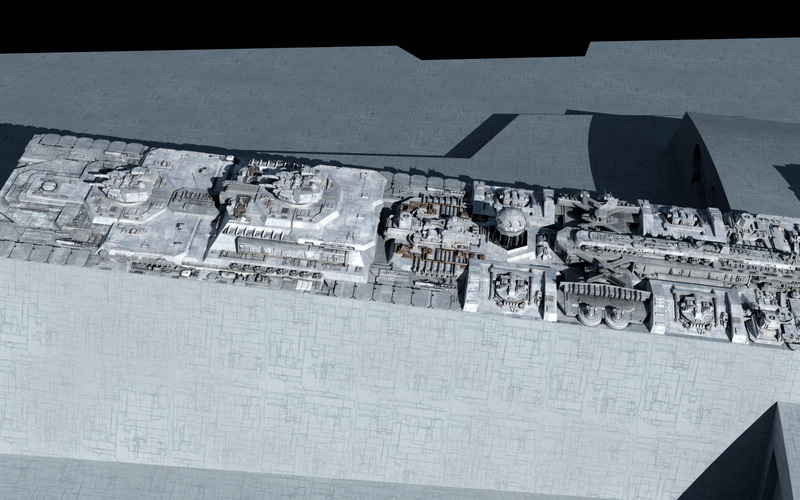 @Fractal, curiosity question: Those 8 greebles, lining the top and bottom of the quad ball turret notch in the side trench, what’s their function? My favorite example of feature creep. 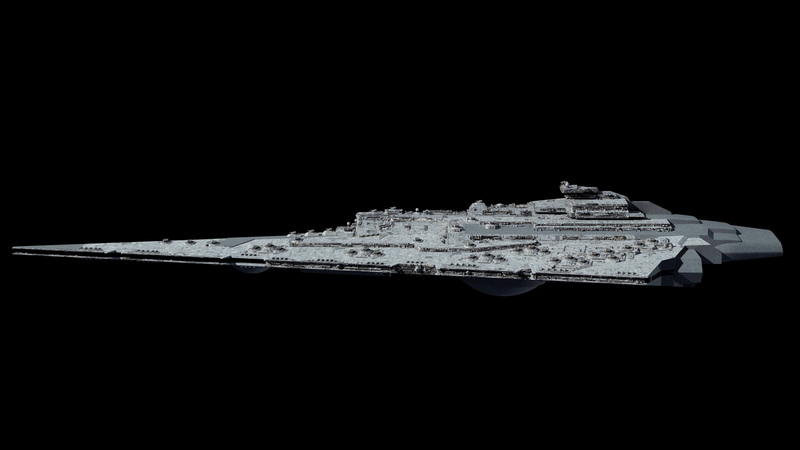 This old gal started out as a Star Cruiser, went straight through being a battlecruiser, and then settled down as a dreadnought. Sometimes bigger really is better. Dear lord..she’s absolutely beautiful! The sheer volume of fire she’d be able to vomit out would be terrifying! A quick question about the Bellator, does she carry fighters? 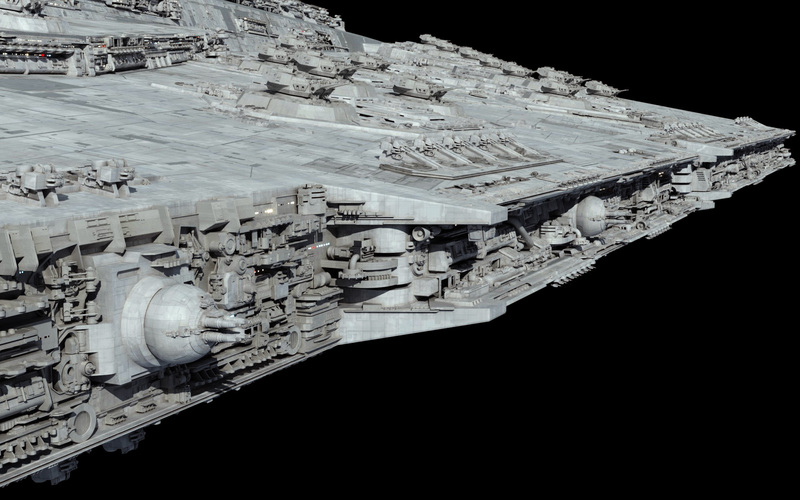 I know she’s not got the huge hangar of the Executor (which always struck me as weird that a ship that HUGE would only carry 144 fighters) but I would assume she carries some even if its more for point defence and bomber interception duty than anything. I believe it was a group of six wings, for a total of 432 fighters. That’s not considering potential variation based on the size of the fighters carried. Only if you believe that Executor carries 144. I personally think they are missing 2 zeroes. I wonder if there’s a single individual responsible for all of these scale brainbugs. The 144 fighter figure, the 5-mile fallacy, the TIE fighters can only go 1500 kph in vacuum speed, the idea that HTL engagment ranges are measured in the tens of miles…. Thanks for summing up the whole phone-game factor so concisely. 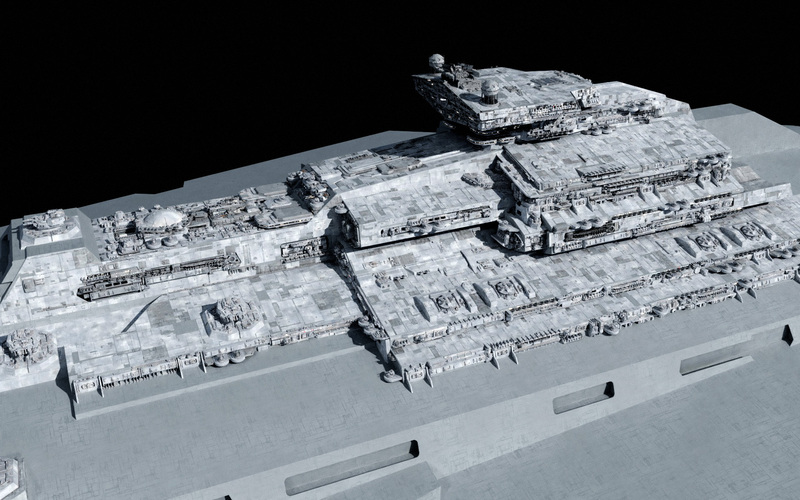 And TBH, if I had to pick between ‘max range of ~15 battlewagon lengths’ and ‘subjectively defined at the GM’s discretion’, at least the latter can be rehashed so starships aren’t being shown up by WWI-era naval antics. The ‘laser ranges are shorter than some ships’ nonsense *almost* seems understandable if you’re just skimming the films, but sub-Cold War-jet performance from machines that casually hit escape velocity will never, ever compute. Almost understandable? The big plot point of ANH comes from a laser that can engage heavily shielded planets from halfway across the system. I don’t think anyone who saw Alderaan explode in theaters can forget that. 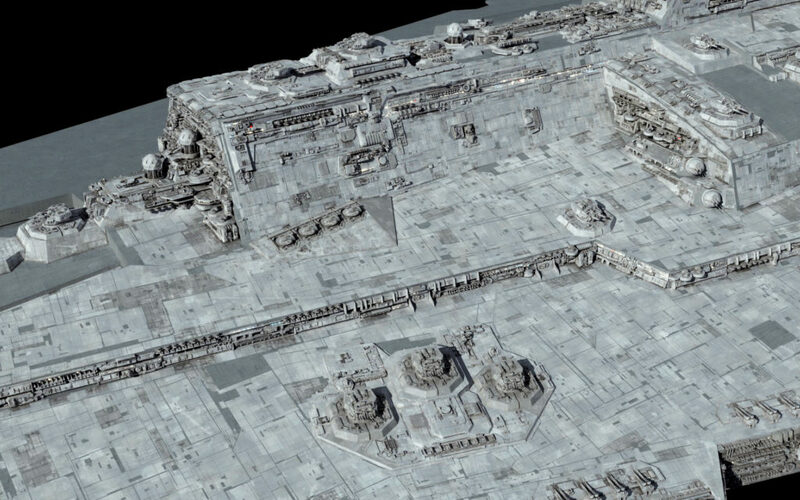 Without seeing Alderaan and the Death Star in the same shot, it’s difficult to make an accurate guess at the range. However, the film adaptation novel states that the Death Star was within six planetary diameters (which was the point where repulsorlift would begin to function). That’s roughly 75,000 kilometers for an Earth-like planet. True enough, but I get the distinct impression many fans just handwave (much) lower-wattage conventional SW lasers as that much shorter-range. A depressing number of Disneyboot-compliant types certainly seem to be rolling with the ‘TL bolts attenuate so fast you need age-of-sail effective ranges in or out of atmo’ concept. 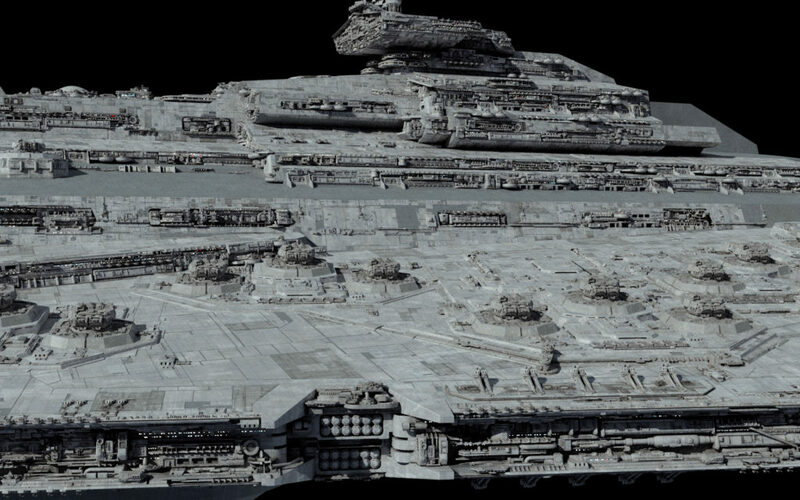 SW starfighters have always been surprisingly slow (funny when warships like an ISD flies faster than a commercial jet at cruising altitude) but I always assumed the escape velocity is aided by repulsorlifs and the real star of the show being sheer maneuverability thanks to inertial compensators. I’d be amazed if repulsors were *that* competitive with ion engines thrust-wise; it’s sorely tempting to chalk up fighters’ lack of gone-in-1/48th-of-an-eyeblink speed demonstration as FX limitations (both conceptual & audience-based). More likely that repulsorlifts require ion drives or some sort of auxiliary boost thrusters to achieve high speeds. Even Luke’s PoS speeder on Tatooine has three of them. It’s been my theory for a while that actual repulsorlifts just provide lift, not thrust, and are dependent on some other method for locomotion. 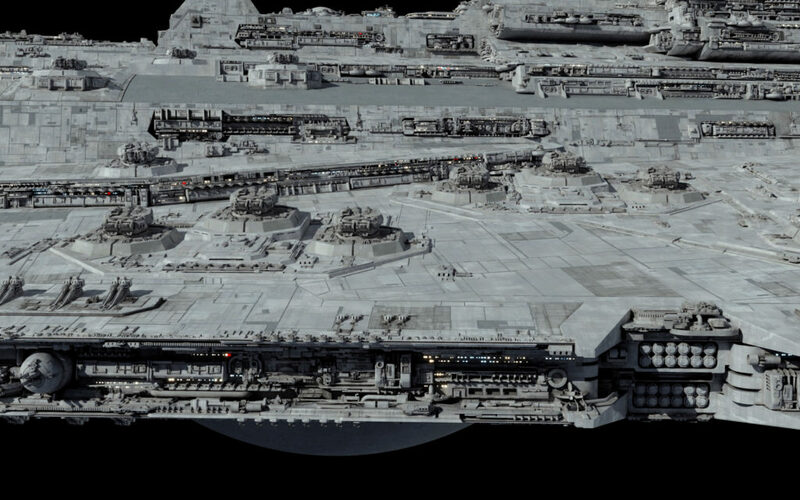 That makes intuitive sense to me, but there are plenty of SW vehicles that don’t have visible thrusters like the AAT, MTT or Imperial Probe Droid and nothing in the ICS that is described as a thruster either for those vehicles. > Fury: From film evidence like the Endor approach, we know pretty convincingly that fighters are capable of ludicrous accelerations and absolute speeds. They just slow down to engage, possibly because they’re operating in spatial jamming fields projected by capital ships and battle stations. You *might* have a point WRT snub structural integrity, though if organic pilot reflexes were a major limiting factor to atmo & vacuum performance alike, you’d think CIS droid swarms would’ve gained a nasty knife-fighting edge that…doesn’t quite seem to be the case onscreen. Even the non-Force-wunderkind portion of that TPM strike were able to (at least briefly) hold their own against the TF blockade’s Vultures. Just recalled one serious structural-strain mitigating factor: tensor fields. Their use probably goes a long way toward sundry non-aerodynamic craft even functioning anywhere near a moon/world in the first place, and almost certainly simplifies the whole ‘don’t even twitch at Mach 24 or you’ll melt’ conundrum even if more aerodynamic snubs retain some atmo-maneuvering edge. Hell, we even see one of the DSII superstructure-pursuit TIEs *ricochet* off two walls before ker-sploding (granted, still at audience-trackable speed, but any current aircraft would’ve splattered on the first hit). Also, a friendly reminder, you don’t need to reply to two different people in the same comment, and breaking up your replies would make this easier to track. The settings here don’t send me notifications of a reply to my comment if you’re replying to my comment as part of a reply to someone else. Gotcha, will do that next time. I just did it the way I did so far just to make it a little streamline for the people reading, but yeah, I get it can get confusing and not notify you. But in regards to your idea, it does sound fair enough and probably can apply to the UT-AT, replace the concept of “repulsorlift skis” with an array of pusher projectors for a more accurate definition of its usage. I’d rather just throw out the idea of the UT-AT being repulsorlift. It’s a fact of the canon that there are certain circumstances where repulsorlifts aren’t a viable means of propulsion. Seeing as how only walker vehicles are named like that (AT-AT, AT-TE, AT-ST, etc), I could see the UT-AT being a purely walker vehicle, but designed with a centipede or ski type leg system to distribute the vehicle’s weight over as wide a footprint as possible. Fractal I notice some of the Oct heavy turbolasers are missing why are they? There’s the same number so far, just re-arranged slightly. I replaced the superfiring barbettes at the forward end of the spine top with twin 720s, and the set up 4 barbettes as flank mounts further back along the spine top. I’m aware of the arrangement it just those were gone on this part of the WIP. Same for the octs near the ship’s bridge. If they are the same then I think it must be rendering errors or something. Oh, I think I forgot to unhide that layer then when rendering the last batch. They are still there in the file. I am aware of the re-arrangement of the octs cannons on the spine top. it just those are missing in this WIP part including the octs on the side near the ship’s bridge. I’m spotting those warhead launchers on the brim and got shivers on the potential tonnage of firepower those giants have in store. *edited* Found them! 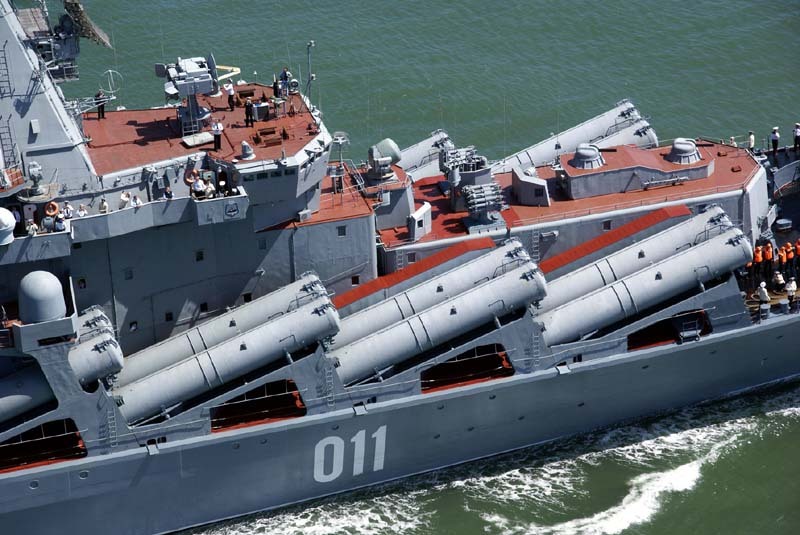 Those missile tubes look like they’d do a Russian Slava class cruiser proud! I’m digging the look of that tweaked engine block/fantail region & the subtly deeper hull already. 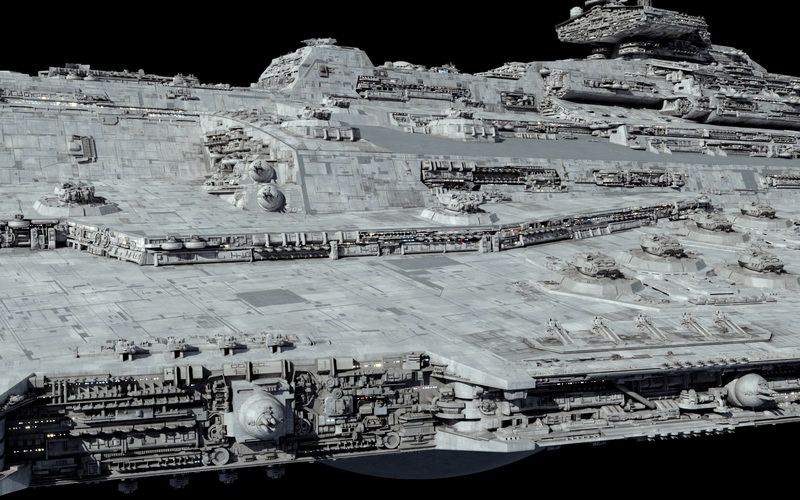 Plus, ye *gawds* the brim-greeble. On a personal note, I believe this will be a very nice addition to the fleet, regardless of missiles! It’s actually always had missiles, it has altogether 96 missile tubes. O did it have forward ones to? I thought it only had flank firing ones, well even better then. Damn, she’s gonna be a beauty. I hadn’t noticed the missile batteries on the older model. 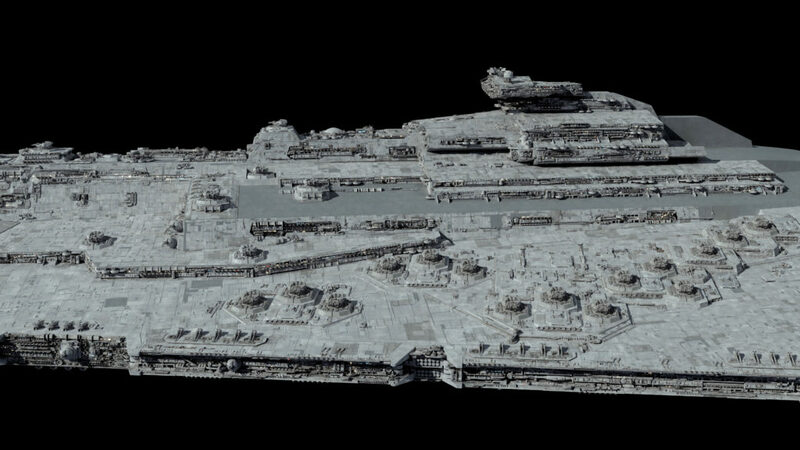 With the size of the ship, each projectile would have to be the size of an Intersector, right? In volume possibly – depends on length. The tubes are ~8m diameter. Think you can post a new image link? The one you used is dead, unfortunately. And yeah, the 4K redo of the Bellator’s really looking good. You could hide a TIE-Interceptor in each tube and start 4 squadrons simultaneously. Artwork on this page are all by me (Ansel Hsiao) unless otherwise noted. Images can be used only for non-commercial work and must be credited. Help support the running costs of the website!